Join CVCA in Raising Awareness during American Heart Month! Walking at least 20 minutes a day can reduce the risk of heart attack and stroke…and work out your pets, too. Take the dog with you when you walk and/or encourage fetch/running play. Use toy mice or the laser pointer to get your cat off the couch and moving. Hugs deliver real health benefits, from easing stress to lowering blood pressure. Hugging or petting your pet also lowers your blood pressure and cuts down on stress hormones, while also soothing your pet. Add up daily calories. Your pet needs your help; measure their food! Minimize table foods and treats that simply unbalance their diet. To learn more about 10 Signs of Heart Disease in Dogs and Cats, click here. Join CVCA Cardiac Care for Pets and the American Heart Association when we say: Take the necessary steps to living a long and healthy life! 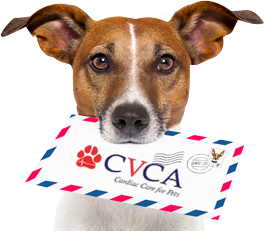 ©2017, CVCA - Cardiac Care for Pets. All Rights Reserved.